Of all of the crops you’re planning to include in this year’s vegetable garden, we think potatoes ought to be on the list. Potatoes done right can be low-maintenance, high-reward and are great candidates for a porch or patio container garden, meaning that even if you don’t have a formal garden (or a yard!) 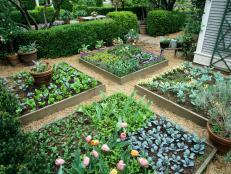 you can still cultivate a great crop in a small space. 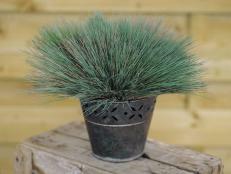 The leafy growth can even pass as pretty, decorative foliage all summer long, making it perfect for outdoor patio decor on a budget. Chitting seed potatoes to plant in a container this spring. Rather than choosing potatoes from the grocery store, purchase your seed potatoes from a gardening source. Grocery store vegetables are often treated to prohibit sprouting. 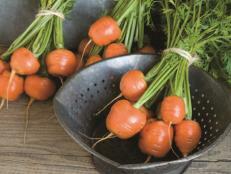 Check locally for popular varieties suited for your climate, or browse sites like groworganic.com and seedsavers.org. Potatoes are planted from seed potatoes, which are potato tubers that have sprouting buds on them. Be careful to only use seed potatoes, as grocery store potatoes can harbor diseases that may ruin an entire crop. To guarantee that your potatoes are disease free, order certified seed potatoes from a catalog or buy them at your local garden center. 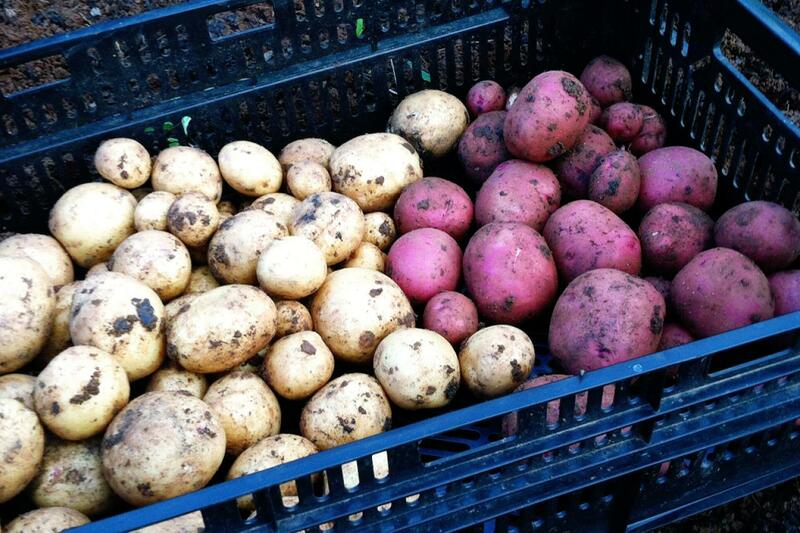 You will have a myriad of potato varieties to choose from. Chitting the seed potatoes is the process of growing the visible potato eyes into shoots. 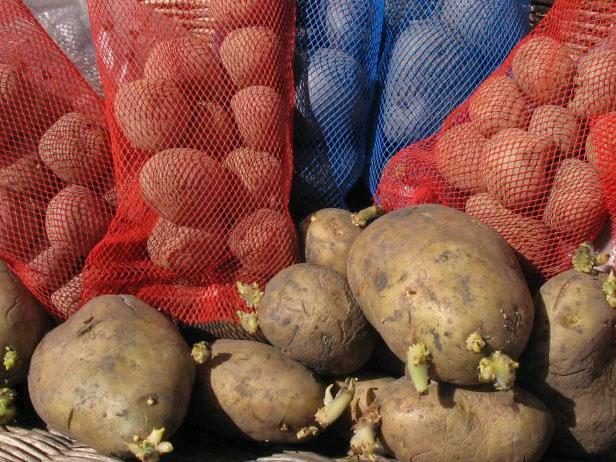 This process can be started as early as late winter and early spring – you’ll need to protect the potatoes from frost, but if you have a cool, bright space indoors in which you can begin this process, you’ll be ready to transfer them outdoors when the threat of frost has passed. Place the potatoes–best eyes up–in a container, and monitor their growth. 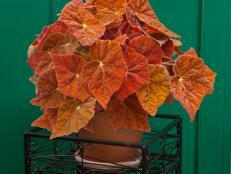 You’ll want a container big enough to accommodate 3 gallons of soil for every seed potato you intend to plant. 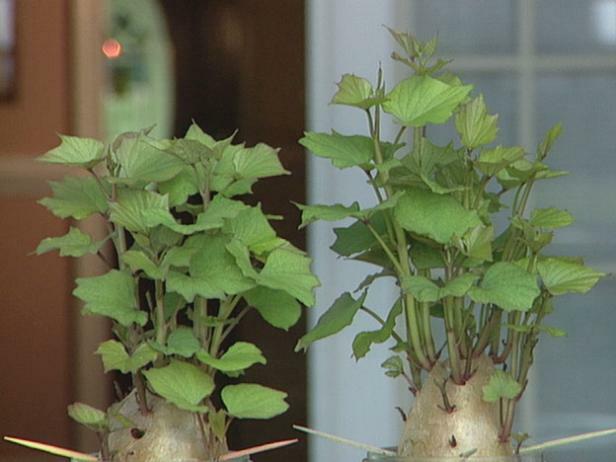 Each plant could extend around 18” in any direction as it grows. Forcing more seed potatoes into a too-small container garden is a recipe for a small-sized potato crop at harvest, if growth is successful at all. You can buy potato growing sacks that are sold specifically for this application, but any container will do. Plastic garden cans, ceramic garden planters, all options offering enough growing room are viable for creating your potato garden. If you are planting in a plastic container or planter, make drainage holes in your product of choice using a drill and bit. Adequate drainage is a must, and it’s helpful if you add broken clay pots or recycled soda cans to the bottom of the container to offer even better drainage. 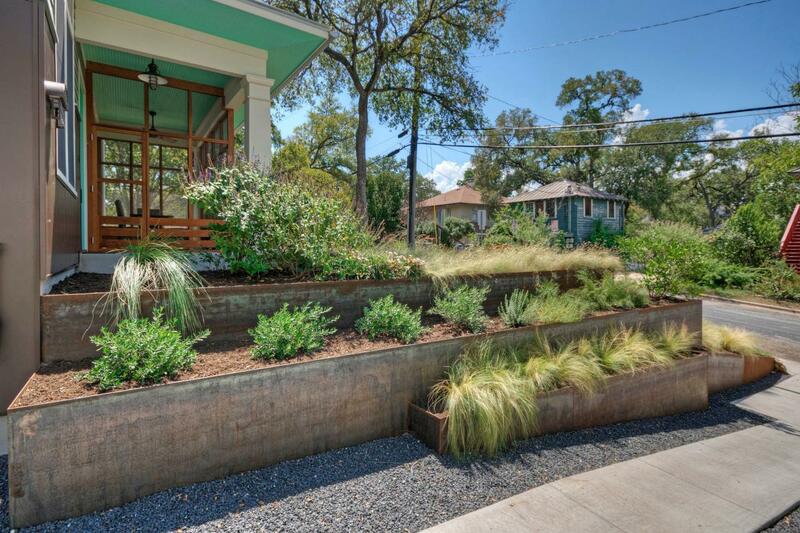 Cover a wall or create a barrier with a tiered planter. 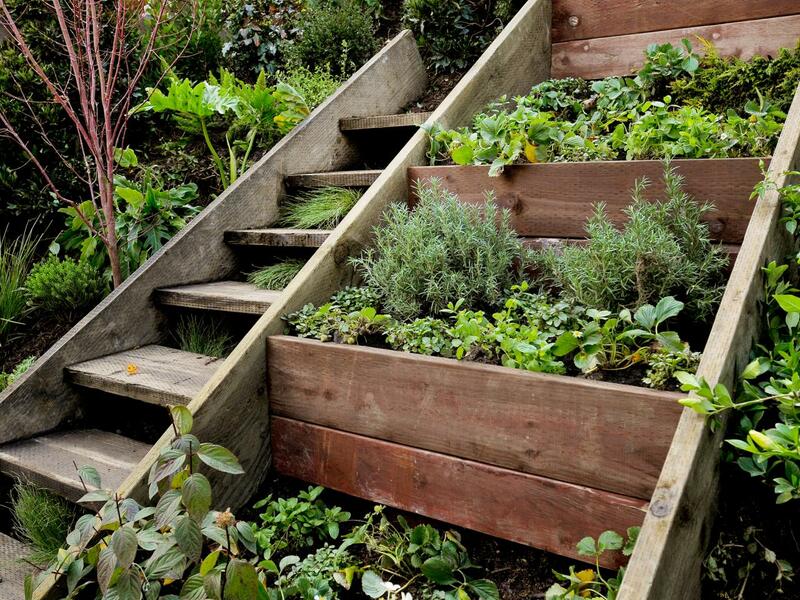 Raised beds can turn any small space into a verdant, productive vegetable garden. 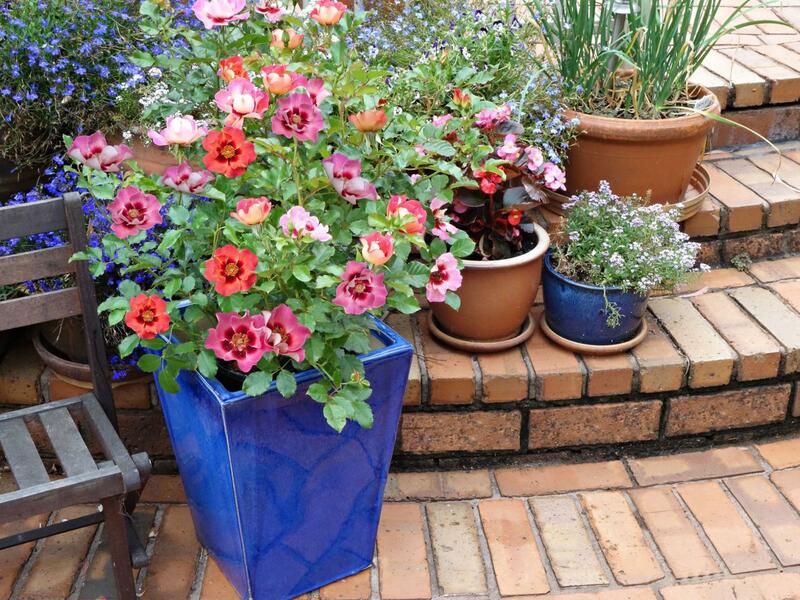 Flowerpots with a mix of colors and textures make for an interesting container garden. 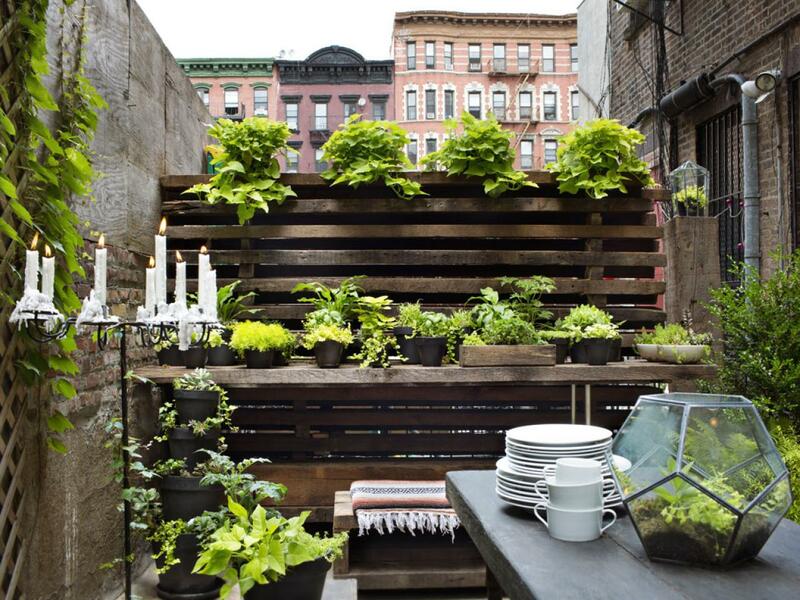 Line a wall or fence with a potting table, potted plants and climbing vines. 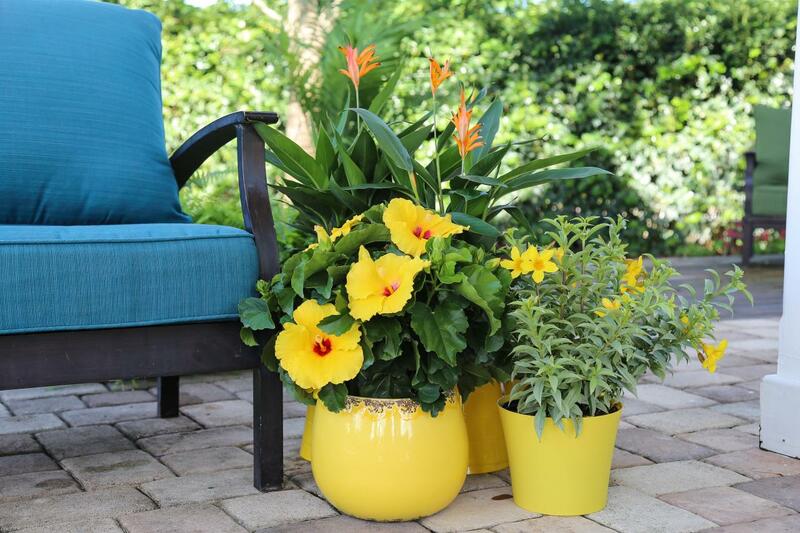 A small sitting area is given interest with exotic-looking hibiscus and a llamandas in colorful containers. 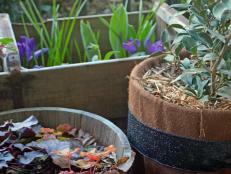 Trailing plants spill over the edges of galvanized planters, softening their aged, rustic look. A double staircase is built into a steep hillside: one set of stairs is for people and pets, the other side is for herbs and plants. 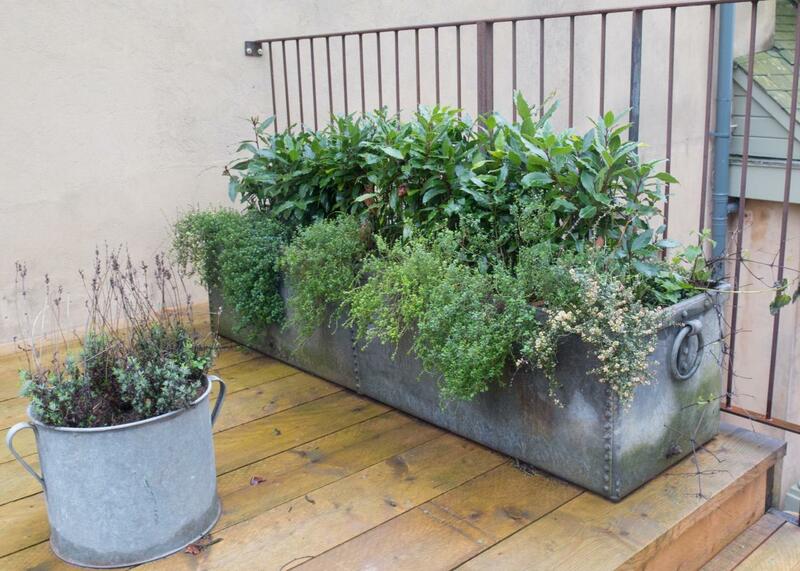 Industrial items make for sturdy planters. 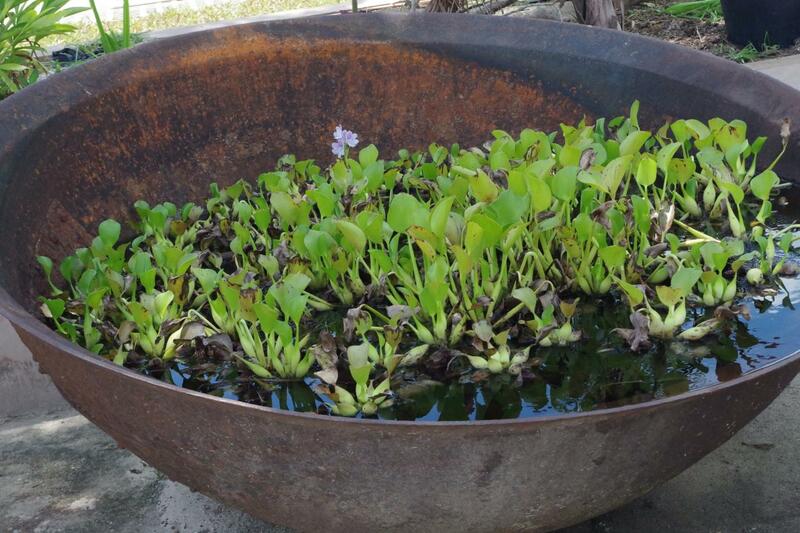 This industrial bowl serves as a small water garden container. 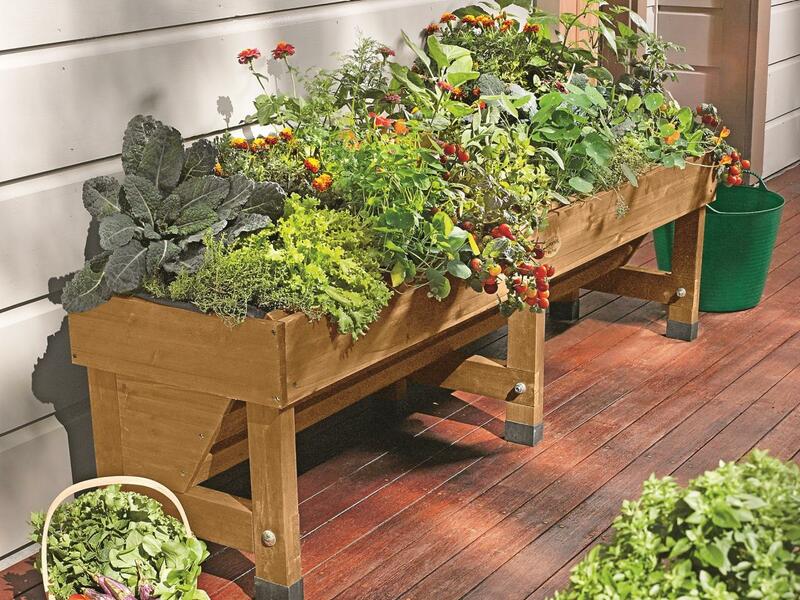 A small space doesn't mean you can't have a bountiful garden. 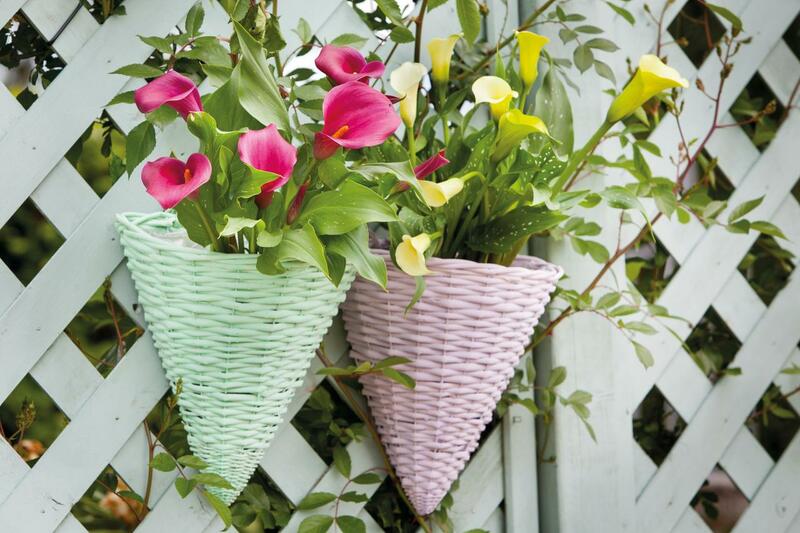 Grab deep baskets and hang them on a fence, wall or deck railing to create a vertical garden that’s beautiful and easy to maintain. 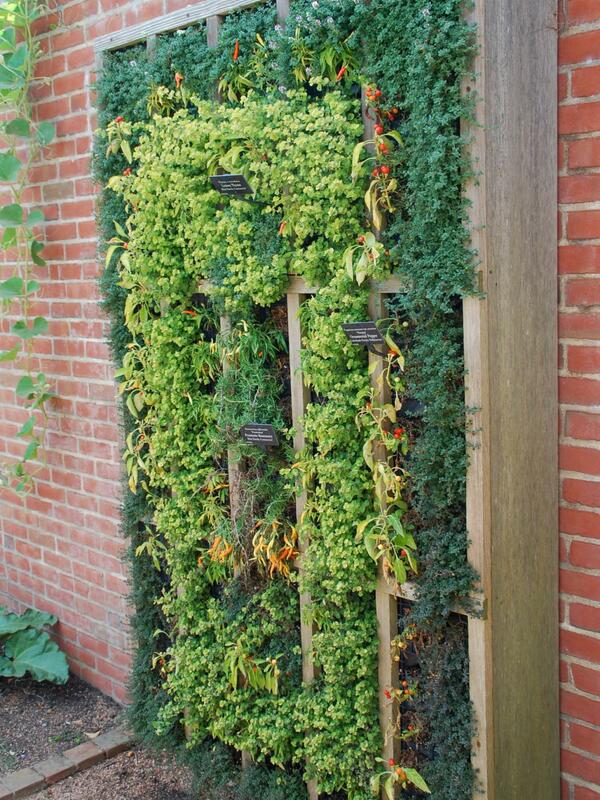 Vertical gardens are a great place to grow greens in a micro space. 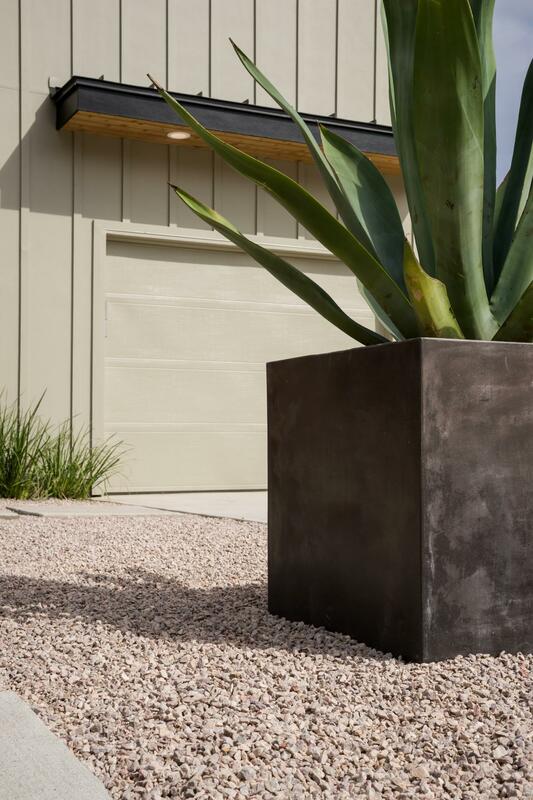 A potted weber agave plant adds texture and a modern touch along a gravel driveway. Once the threat of frost has passed and gardening season is in full-swing, you’re safe to move the potatoes outdoors and plant them in their container garden. 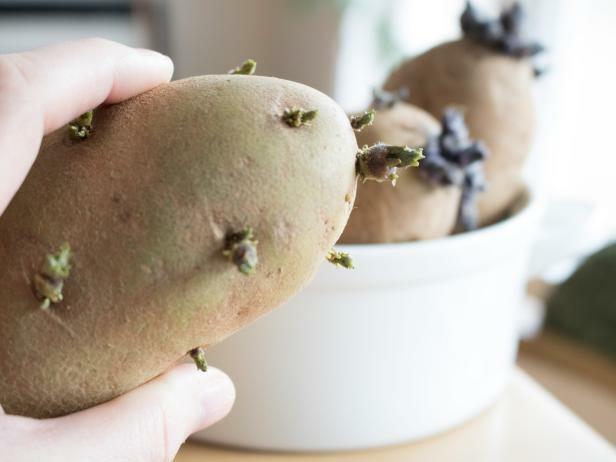 If your seed potatoes are small you can usually plant them whole, but for larger potatoes you should cut them down into pieces that each include a few sprouts. Add soil to the bottom 1/4 of the container. The soil can be a mix of planting soil, compost, or soil straight from the garden, but potatoes do need plenty of nutrients to be successful, so you may need to fortify periodically with a liquid fertilizer. Place your sprouted seed potatoes atop the soil, eyes and shoots upward, and lay an additional 3-4” of soil on top to cover the potatoes completely, but don’t entirely cover any leaves that have appeared. 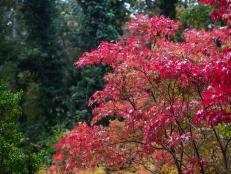 Over the days and weeks, you’ll witness more leafy growth. You should continue to add more layers of soil to the container, never fuily covering the growth but offering more soil into which the potatoes can expand. You can continue adding layers of soil until you reach the very top of the container. Hydration is key for potato growth, but don’t overwater. 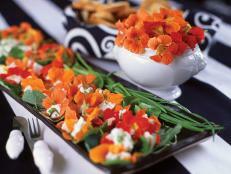 The goal should be to keep the soil moist, but not oversaturated. Natural rainfall should be factored into your watering plan. 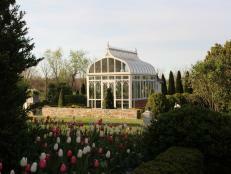 If you choose, supplement with a fertilizer once or twice during the growing season. 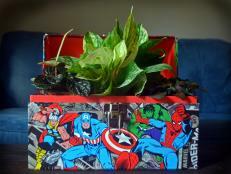 The plants will thrive best with a pH 6 soil level. It’s hard to tell what’s happening beneath the surface of the soil – fingers crossed that it’s a success! At any point mid-growing season, it’s OK if you gently reach inside the soil to feel for new potatoes, and if there are any large ones, you can remove them at any point because making space in the container garden allows room for the remaining potatoes to achieve more growth. By the end of the summer, you should to see the leaves yellow, at which time you’re safe to harvest your entire haul. Wearing gardening gloves, reach in to remove some soil, and rifle around for your treasures. 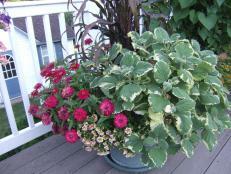 Clean the planter, allow it to dry, and store it for next year. Once removed from the soil, allow the potatoes to dry for a day or two, and then brush off any excess dirt and store in a cool space. Leaving some dirt on the surface is fine, it helps to preserve the potato until you’re ready to clean and cook with it. Potatoes store well only when cured after harvest. Hold them at forty-five to sixty degrees with eighty-five percent humidity for two weeks before moving to cool storage.This process will toughen the skin and heal wounds.